In the old days, people who needed to have their teeth straightened had no choice but to get metal braces. These consisted of wires and brackets that slowly pulled the patient’s teeth into the correct alignment. The patient might have also worn headgear for the same purpose. Now, people have many more options. They can still get the standard metal braces — or they can get something else. This is the standard type most people are familiar with. The brackets, however, are smaller and less obtrusive than they once were. They also now come with heat-activated arch wires that use the client’s body heat to make the teeth move more quickly and easily and with less pain. Metal braces are less expensive than other types. Despite the improvements over the years, they are also still the most noticeable type of braces. Most patients have to wear them for around two years. Ceramic braces resemble metal braces in size and shape, and they also involve brackets and wires. The brackets, however, are either transparent or the same color as the patient’s teeth. Either way, they blend in with the teeth. The wires may also be tooth-colored. Ceramic braces are significantly less noticeable than their metal cousins. They are also more expensive. The brackets can become stained if the patient doesn’t scrupulously clean them. Ceramic braces are also more fragile than are metal braces, and they are more likely to break or get chipped. As ceramic is harder than enamel, ceramic braces can damage teeth that rub against them repeatedly. Lingual braces are metal braces in which the brackets and wires are placed on the inside of the teeth. While this has the advantage of keeping the braces out of sight, it also makes them hard to clean. They are also harder for the orthodontist to clean or adjust. Lingual braces are also more expensive than traditional braces, and they do not work well for severe dental problems. consists of a series of transparent plastic retainers that resemble mouth guards. Unlike braces, which are attached to the teeth, the patient may remove the aligners whenever they wish. That enables them to eat what they choose while somebody wearing braces has to avoid certain foods. Invisalign® is one of the more expensive options, for the aligners last only two or three weeks and have to be replaced. Most patients need 18 to 30 aligners. 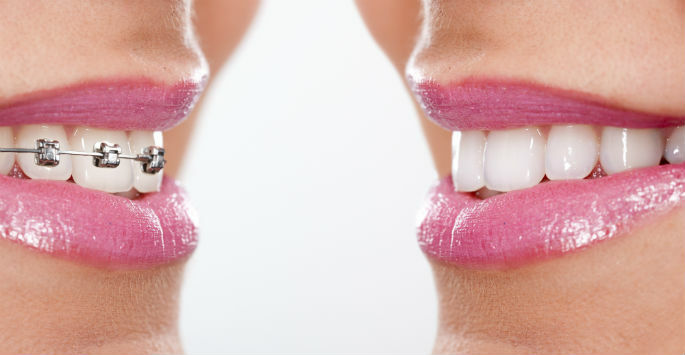 Invisalign® is mostly used for treating crooked teeth. On the other hand, since the retainers are removable, it is much easier for the patient to thoroughly clean their teeth. Thus, a patient using Invisalign® is far less likely to develop the gum disease or tooth decay that can plague someone wearing attached braces. If you’re looking to straighten your teeth, contact Tenn Yuk Orthodontics today to schedule a consultation. By working together, we can develop the appropriate treatment plan for your needs.